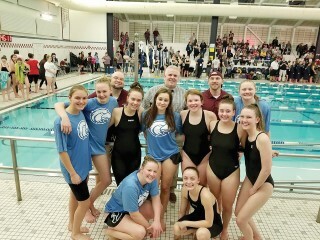 On Friday February 9th the Windham Boys swim team traveled to Cape Elizabeth on Friday, February 9 for the Southwestern South Swim Meet. The energy was high, and the Windham boys exceeded everyone’s expectations placing 5th overall. There were some outstanding events, and everyone had time drops. To kick off the meet, the 200-Yard Medley Relay team came in 4th place. Congratulations to that team which consisted of Evan Desmond (sophomore), Michael Ryan (Junior), Simon Gabaree (freshman) and Dominic Agneta (senior). In the 200-Free event, Dylan Palmer came in 8th, dropping 5 seconds and Griffin Black followed closely in 9th. Michael Ryan placed 6th in the 200-IM. The 50-Free Event is always fast and exciting. Dominic Agneta placed 6th overall with an amazing time of 25.09. Nathan Plummer, Jamie Louko and Lucas Howard each dropped time in the swim event, as well. Dominic Agneta set a personal best for the 100 Yard Free of 56.80 and both Nathan Plummer and Michael Ryan added points for the team with their 200 Freestyle Swims. Then came the grueling 500 Free Event where Evan Desmond qualified for states with a time of 5:48.89 crushing the qualifying time of 6:05. Dylan Palmer placed 6th overall with a stunning time drop of almost 20 seconds. The 400-Free Relay team of Dylan Palmer (senior), Jamie Louko (sophomore), Griffin Black (freshman) and Lyden Fogg (freshman) wrapped up the meet in 5th place with a time drop of 42 seconds. The next day, Saturday, February 10 was the girls turn. The energy of the team was high given the boys performance the day before. The girls were seeded tenth, but the girls would have nothing of that and finished an amazing 6th place. The best results for the girls in over five years. The meet started off with a great swim by the 200-Medley Relay team of Julia Hills (junior), Katharyn Lucas (sophomore), Hannah Maurais (sophomore) and Sophie Simonson (senior) placing ninth overall. with a great swim as well. After the diving competition, Haley Theberge placed 5th in the 100-Freestyle and both Hannah Maurais and Chloe Wilcox added more points and dropped time. The 500-Free Race saw Elizabeth Lucas drop 13 seconds and place 7th overall with a personal best time of 6:21.04. The spectators were on their feet and the noise deafening when the 200-Free Relay took place. The Windham team of Julia Hills, Katharyn Lucas, Hannah Maurais and Sophie Simonson rocked the building with a 4th-place finish, breaking the two minute barrier with a time of 1:59.21. Katharyn Lucas then swam the 100-Breast Stroke Event and finished 6th with a fourth second time drop to a personal best of 1:19.33. Finally, the meet was wrapping up with the 400-Free Relay left. The Windham team of Elizabeth Lucas, Sophie Simonson, Chloe Wilcox and Haley Theberge won their heat and placed 5th overall to a standing ovation. Congratulations to Elizabeth Lucas (senior), for being awarded with the Southwestern Maine Swim Officials Scholarship for 2018 for Outstanding Achievement. The states swim meet is being held this year at UMaine Orono. The boys swim is on Saturday, February 17 and the girls will swim on Monday, February 19. Congratulations to the swimmers who have qualified to swim and good luck to each of them.